The Vermeer mini skid steer can handle a wide array of jobs –from irrigation systems and hardscape projects to tree care removal and fiber optic installations- all without sacrificing performance. 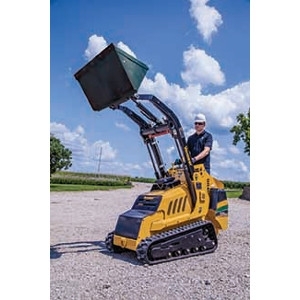 36" wide, Has an operating load of 750 pounds, Auxiliary hydraulics for running accessories. Weighs 2,880 pounds. Large fuel capacity. This is a great machine for hauling rock, mulch, or dirt. Attachments: tiller box, auger drive, and bucket.